So exciting!! Can't wait to see all your great ideas! Plan looks perfect! this is so exciting ! can't wait to follow your house building journey. are you far from where you use to live? Thanks for giving us a glimpse of your progress and I am excited to follow you in this exciting journey! We've never built our own, only done lots of renovations. I always think starting from nothing would make me nervous too :) But I love your house and floor plan. So true - you just never know what the future holds! :-) Sounds like some beautiful plans. Yes, it has definitely been quite the process... getting to the building point has involved so many steps I never would have thought of! Love your new house plan! It's an adorable house with a great layout. Congratulations! I love William Poole designs! A great NC architect. We have been pouring over house plans too, seeking the perfect plan for our downsized home. Love your plan. Looking forward to the progress. Thank you so much, Diana! So sweet of you! Thank you, Hillary! That is so sweet! I've grown to love Craftman bungalows. It's nice to have the guys work on the utilities too. Love the pictures of the girls and dogs:). I'm sure the parents are more than happy to help anyway they can for your family to have a beautiful home. Like everyone else, I'm so happy for you all! Thank you, Kathleen! We are so excited and thankful too. :-) I know what you mean about Craftsman bungalows... they have really grown on me too! There is a neighborhood here that has so many new craftsman bungalows built and they are just so charming. How exciting! And what a wonderful thing to be living so close to parents/grandparents. Congrats on your home...Exciting time for you all. I'm so excited to follow your new build, especially the kitchen. You chose a beautiful plan! We just purchased a few acres and plan to build our one-story craftsman home next year. I need suggestions from your readers...My dishwasher quit working, so I've been hand washing dishes for a couple of months. I'm actually enjoying this new chore. It gives me the opportunity to complete a simple task, reflect on my day, and see/touch a cleaner dish. Less EM radiation, lowers the electric bill, and no toxic chemicals. I work full-time and have a family of 4 still living in the home. I'm considering NOT installing a dishwasher in our new home!?!? I don't care about resale because this will be our home through retirement. (I'm in my late 40's now.) Any feedback would be appreciated. I'm so excited for you Andrea. The plans look lovely. So glad your blogging about the progress. How fun. Wishing you all the best and sending prayers your way. Breaking ground is such a great feeling! 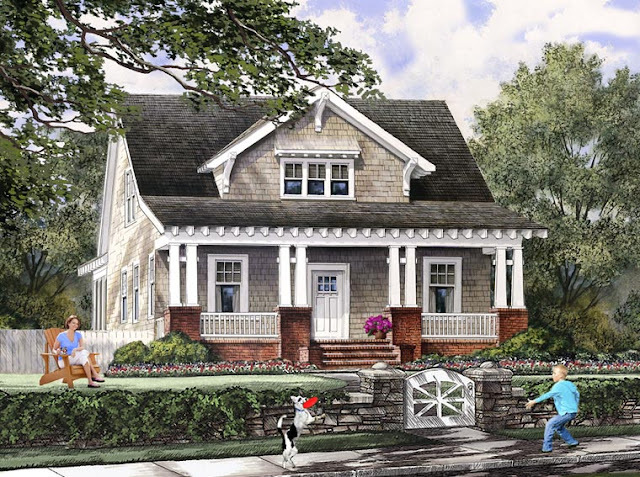 Love the exterior plans! So happy to read your journey! I hope you keep posting your progress. Love the interior designs and floor plans. It seems so wonderful to be near both sets of grandparents and for them to share in your plans. It is understanding that the transition is a bit difficult for your sweet girls - including them in the process will make it easier and fun! Can't wait to see how you decorate your cozy new home!!!! So happy and excited for you Andrea! A new house always brings new hopes, vitality to everydayness and many opportunities for creativity. Good luck!